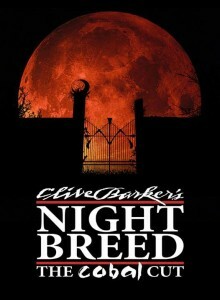 Horror fans were treated to great news last summer when Scream Factory revealed it was at work on restoring Clive Barker's original vision of his 1990 directorial effort Nightbreed on Blu-ray. The presumption was that this was going to be "The Cabal Cut," a 160-minute cut of the creature feature that has been making the film festival and convention circuit rounds. "I've seen footage that hasn't even made it into the version at the screenings. The story is all there. Clive's vision is complete. It's a thing of beauty. Shout! Factory is going to restore it with tender loving care." "The Cabal Cut was created by us in-house from the footage we found in the storage rooms. This 160-minute beast has every bit of Nightbreed footage we had access to incorporated into the cut. We put everything we found back in a) just to be able to say we'd seen that version and b) because we needed as much of the proverbial scultpor's rock to chip away from for what would become the finished masterwork: The Director's Cut." Miller goes on to say that the restoration process is well underway and that some scenes from "The Cabal Cut" are being cut or trimmed. "More importantly, the VHS footage will be put through a high-definition digitization process to make certain that this is the best version of Nightbreed possible." I'm happy to hear that what's coming is not "The Cabal Cut," to be honest. While I thought it was an interesting experiment, it was deeply flawed, in spite of having everything thrown back into the film. No release date for "The Director's Cut" has been set.